Over the last few years Criterion Barrels has been laboring to constantly develop and improve upon new barrel models. The expansion of our inventory selection has allowed us to better accommodate manufacturers, retailers, and individual rifle builders. 2015 has proved to be no exception. We have a number of new barrel options that have been added to our existing product line, and a few that will be completing production within the next couple of months. We have broken down some of our product development projects into three primary subcategories based upon their overall level of completion. In an effort to offer a more comprehensive service to our OEM clients, Criterion has taken steps to add a number of innovative features to our production processes. CBI has opened new relationships with multiple custom finish providers to better accommodate clients seeking to expand beyond our pre-existing finish selection. 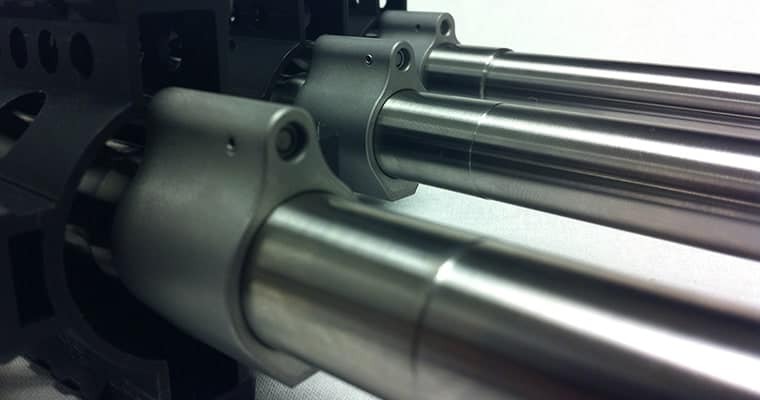 Test results with barrel nitriding have proved promising, and plans are in the works to further expand our product selection to incorporate this new finish option. Many of you have been patiently waiting for the release of our Lee Enfield No.4 replacement barrel. We have worked to overcome a number of complications that arose from tooling requirements and receiver tolerance variation to assemble a barrel that will function with the vast majority of all pre-existing rifles. Our installation and accuracy testing has almost reached completion, and we expect to begin work on the existing blanks shortly. The finished No.4 barrels will be available in two different configurations. The first will be a standard barrel with material added to the shoulder. A gunsmith will need to use a lathe to adjust the timing to accommodate variance between receivers. A second model will be available through select distributors for gunsmiths who prefer to install the barrels without requiring a lathe. The shoulder will be set back on these models, and will include a set of breeching washers to compensate for variation found between rifles. For those seeking a barrel for the SMLE No.1, we are currently in the process of developing a print for that barrel configuration. The No.1 will be able to utilize the same blanks as the No.4, allowing us to begin production shortly after the release of the initial No.4 barrel batch. While we have produced make-to-order 6.5 Creedmoor barrels in the past, CBI is currently in the process of adding a few stock model options to complement our updated .308 AR product selection. Two variants are currently in production, including 18” and 22” Hybrid contour models. While CBI has been able to offer fluting services in the past, new tooling has been purchased to offer custom designs and patterns based on OEM client requirements. These various design configurations provide CBI clients with the ability to produce barrels featuring a unique visual appearance that serves to set their rifles apart from those of other competitors. Criterion is currently evaluating the possibility of adding a few new M1 Garand barrel models to inventory. Options may include a medium/heavy barrel contour, and an M1D barrel featuring an integral scope base built to the original print specifications. Please feel free to submit feedback if you are interested in barrel designs of either type. Criterion is looking to expand its product line to incorporate barrel models for Kalashnikov pattern rifles. The AK has long experienced a reputation for poor accuracy due in part to the prevalence of low quality ammunition, cartridge limitations, and the use of substandard components in rifle production. Our mission at Criterion is to eliminate one of the variables contributing to that opinion. CBI is currently in the initial stages of developing a Tabuk reproduction barrel to be installed on Yugo M70 receiver kits. This project is part of a forum-based group buy, but may be an opening act in the development of an entire product line dedicated to this unique platform. We are currently seeking out high end AK manufacturers and builders interested in developing a rifle that can overturn the notion that the AKM is an inherently inaccurate firearm. A number of shooters have voiced a need for high quality replacement barrels designed with this widely available surplus rifle in mind. The addition of aftermarket stock and trigger components have led to the creation of a community seeking to accurize the venerable M91/30 action. While Criterion has the capability to produce a complete reproduction barrel featuring a rear sight dovetail and front sight post, the cost of an exact replica would likely exceed the price of a complete replacement rifle. By offering a replacement barrel in a heavier tapered contour, Criterion could offer a finished barrel at a quoted rate on par with our average stock model barrel pricing. Featuring a hand lapped finish and a consistent level of bore uniformity not found in any existing aftermarket replacement barrel, production may proceed as soon as we are able to find a distributor looking to service the Mosin Nagant community.